What is the fastest way to set endcaps? Everyone has their own routine. This is basically how I do it. Check to make sure you have enough product to satisfy the endcap. Also make sure you have the time to do it! Don't try to do a Glade candle endap when you have 15 minutes to complete it! We actually had someone do that today. Tie the Pog and put in the Pogfill. Talk to the backroom! Do they have time to pull the product or do you need to pull it yourself? Do not assume. Also make sure it is pulled before you empty the endcap. Print Pog labels. Do not do this days before setting. Sometimes the items will have price hikes or declines. You should always print the labels the day you set. Empty endcap and clean all shelves! Work product that was removed back to the floor and take any leftover to the backroom to be backstocked. We put a note on all endcap product we take down so the backroom can do their magic with the 99 thing. Set shelving to the right height, attach fencing if needed. Put up labels. I also put up the header at this point. Fill according to how many facings and how high they are to be stacked. I always do a sign audit on endcaps to make sure the right signs are up. Gtc to tell! You can look at online Plano's or use your eyes looking for product in br. For ex: paper endcaps. You can use a portable printer for endcap labels too. Thanks! I will use these tips in the future. I was actually told not to print labels in advance today. I didn't ask why not, but I have a feeling that's the reason or is there more? I'm not new to setting, but I'm pretty much new to setting during the day. I've done planograms with the POG Team, as well as the Extreme Remodel, and a Planorama. But now I'm pretty much setting while there are guests shopping and the shelves aren't empty. So I want to learn the best strategies to set multiple endcaps a day. By using a portable printer is the fastest way to get current pricing. Plus, you can fix any other price issues too. How long should one endcap take to complete? How about a focal? 2 hours with distractions by guests & backup calls. It is highly suggested to make sure you have 100% product in. Or you could do what I've seen an STL do: Tie the POG but don't put in the POG fill and fill it up with clearance. Leave any signing on my cart and shrug your shoulders when I ask what the heck is going on. Or tie multiple salesplanners into one endcap to make it look like you did it on TWT. Then when the product starts flowing off the truck totally confuse flow team of what product actually goes on the endcap. I walk by and say - "Did you make sure the end-cap is tied / bolted to the rest of the isle" ? His answer was - "Ive been doing this for years - don't bother me"
I walk by him again and say - " You shouldn't put all that heavy crap on the upper shelves"
He said - "You really should start minding your own business"
He comes over to survey the damage - I walk past him and just said ---- "You know best"
Or would that be just too much to ask? Wow. I hope someone gave that ETL a good punch in the face. Why wasn't the end frame bolted to the rest of the gondola? Or why wouldn't it be? I'm told that this often happens because spot thinks the store has more endcaps then it actually does so in order to stay green they to 2 (or even 3) to planners to 1 encap rather then E-info the problem to get it fixed. Though I can understand why they might not want to e-info. The last TL who tried to fix this waited 3 weeks for a reply. 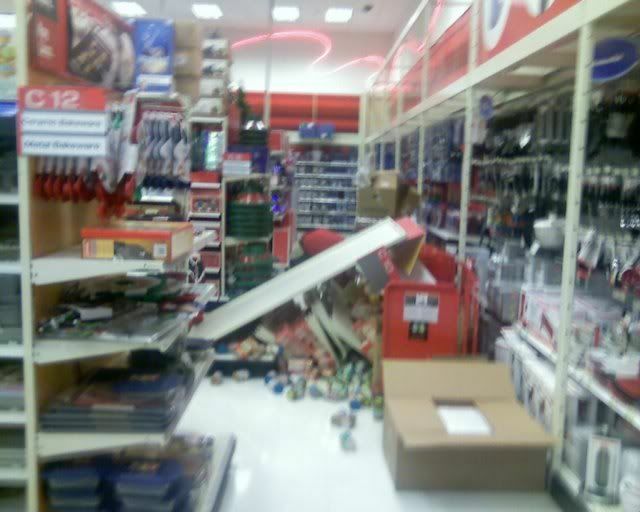 When it came through, it was discovered that they just transferred an endcap to another section so we still had too many.